Tesco Charity of the Year, 2005. The Irish Hospice Foundation and Tesco Charity of the Year programme. 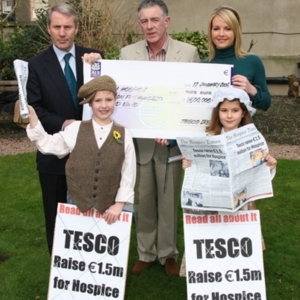 Images from the Irish Hospice Foundation and Tesco's Charity of the Year 2005 programme. Tesco's Charity of the Year. Ireland's Biggest Coffee Morning Collection. Irish Hospice Foundation promotional photographs for Tesco's Charity of the Year programme. the focus for Tesco staff fundraising efforts during that time.